Want to sell your IVD in Brazil? Brazil regulators made sweeping regulatory changes in 2015, especially for IVDs. In particular, they consolidated and aligned IVD regulations with international guidelines. 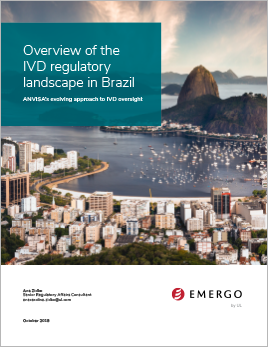 These changes had a significant impact on IVD manufacturers and Brazilian regulators. We'll answer your biggest questions and more in this 7-page white paper. Ana Carolina Zidko is a Senior Regulatory Affairs Consultant in Brazil. Her areas of expertise include regulatory submissions for medical devices and IVDs in Brazil and INMETRO certifications. She holds a master’s degree in microbiology and immunology from the Universidade Federal de São Paulo (São Paulo University).